Mount Ida, known variously as Idha, Ídhi, Idi, Ita and now Psiloritis (Greek: Ψηλορείτης, "high mountain"), at 2,456 m (8,057 feet), is the highest mountain on Crete. Located in the Rethymno regional unit, it was sacred to the Greek Titaness Rhea, and on its slopes lies one of the caves, Idaion Antron, in which, according to legend, Zeus was born. Its summit (Timios Stavros) has the highest topographic prominence in Greece. A natural park which includes Mt. Ida is a member of UNESCO's Global Geoparks Network. The Skinakas observatory of the University of Crete is located on the secondary peak Skinakas at 1750 m. It has two telescopes including a 1.3 m Modified Ritchey-Chrétien instrument. The Nida plateau is found to the east of the mountain. On the summit of Ida is the little chapel of the Holy Cross, Timios Stavros. On the plateau are some shepherd's huts (mitata) built only of local stones, and used both for shelter and for cheesemaking. In ancient times the Idaean cave, "cave of the Goddess" (Dea) was venerated by Minoans and Hellenes alike. By Greek times the cave was rededicated to Zeus. The cave where Zeus was nurtured is variously stated to be this cave, or another of the same name, or the Dictaean cave. Votive seals and ivories have been found in the cave. Like the Dictaean cave, the Idaean cave was known as a place of initiations. It may have served as the site of an oracle, symbolized by the frequent depiction of a tripod on coins of nearby Axos, which presumably controlled the territory around the cave. ^ a b "Mount Ida, Greece". Peakbagger.com. Retrieved 2 May 2015. ^ a b c "Europe Ultra-Prominences". Peakbagger.org. Retrieved 2 May 2015. ^ "Skinakas Observatory". University of Crete Department of Physics. Retrieved 15 March 2015. ^ "Skinakas Observatory". Skinakas Observatory. Retrieved 15 March 2015. ^ "Introducing Mt Psiloritis". Lonely Planet. Retrieved 15 March 2015. ^ "Eastern Crete Mountains". A Crete Guide. Retrieved 25 August 2015. ^ "Tacitus, Histories — Book V Chapters 1‑13". penelope.uchicago.edu. 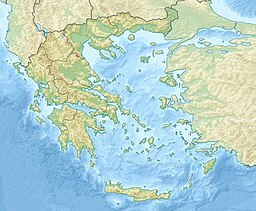 Wikimedia Commons has media related to Mount Ida (Crete).